With the last session of our 6 week intensive Project Based Learning program LEAP at Green School Bali, we tried something slightly different to kick off the program. 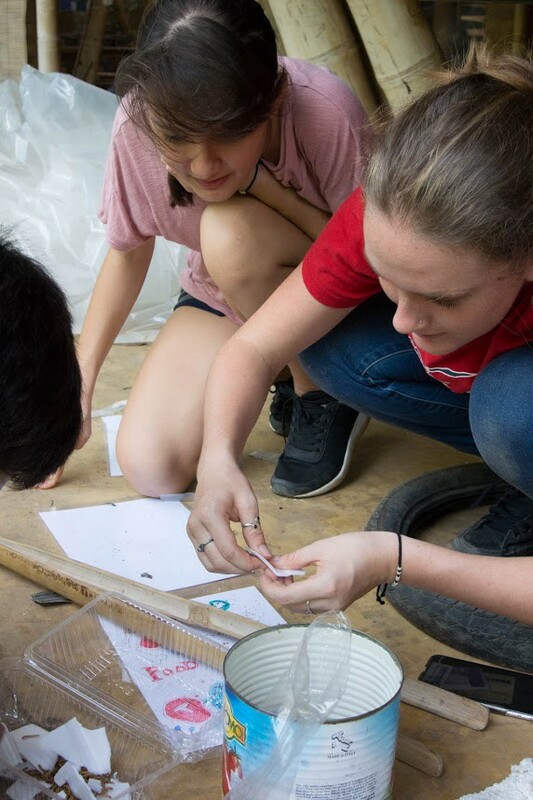 In the past, we have used the time to do team building activities and identify common interests in the hopes that our students will find projects that reflect their passions. This latest iteration, we changed it up, creating what we dubbed mini missions to get the students exposed to a wide variety of activities in order to ignite new interests. From first impressions, I think we are on to something pretty solid here. We did not want to bridle our students with a full blown project of our making. In fact, we wanted something that we could complete in a single day. Our desire for the mini missions was to get the kids out of their comfort zone, and pursue something they would never think of themselves. The mission should also be something that the entire group could collaborate on with a single product that they all could feel they were part of. Finally, it has to be something that we, the teachers, were really keen to explore. Some of our inspiration lay in watching videos online that sounded feasible, and replicating the experience using our local supplies. Mau decided that he wanted to test whether mealworms do in fact consume (and digest) Styrofoam. Could these little worms be part of a potential Styrofoam reduction effort? I got my inspiration from my commute. I noticed that there was much Graffiti art in Denpasar, and found out that it had in fact been covered by Vice Magazine. We made a call to dedicate our first week to doing these possibility expanding exercises. Unfortunately, other school activities broke our group up and we had to think quickly about how to work this. For a first attempt, we set our older students up with all they would need to create an interesting experience for the rest of the group in the afternoon. It may have been a bit early in getting to know one another, but they found it challenging to apply their usually creative brains when the context was so broad. The next day Mau and I repeated the activity, this time with us taking the poin on building the activity. We decided to engage them in a role play about a zombie apocalypse on Bali. We jumped into a bus with roles and secret missions for each student, and went on a short adventure all within 20 minutes of our school. 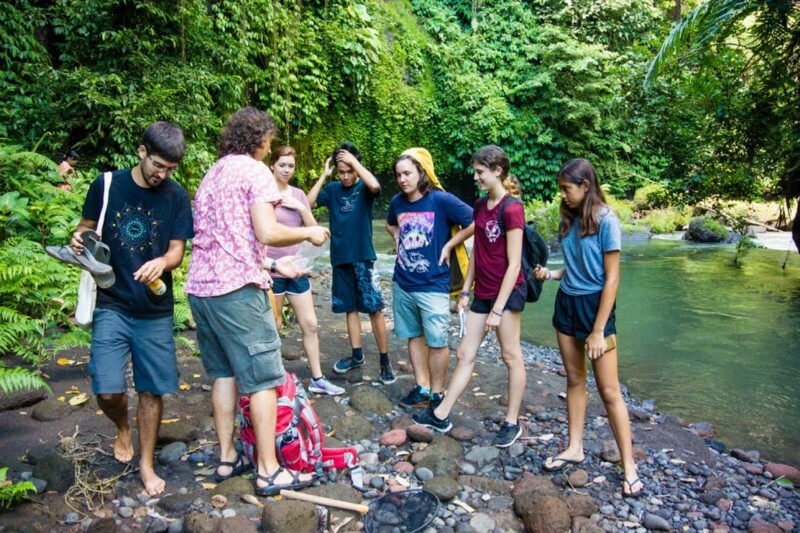 The students were amazed to find themselves in the last stand of Lowland Rainforest in Bali, followed by a guerilla cleanup of an epic banyan tree. Finally, we ventured through an active irrigation tunnel which took them through the pitch dark underground up to their waist in water. The whole experience was put into a context where we could act goofy, run from imaginary zombie hoards, and will ourselves into dark tunnels to escape from infectious bites. While a great team building experience in itself, it also shed some light onto what creativity can bring to a project. Our final day of the Mini Missions allowed students to multitask and explore some very different projects. 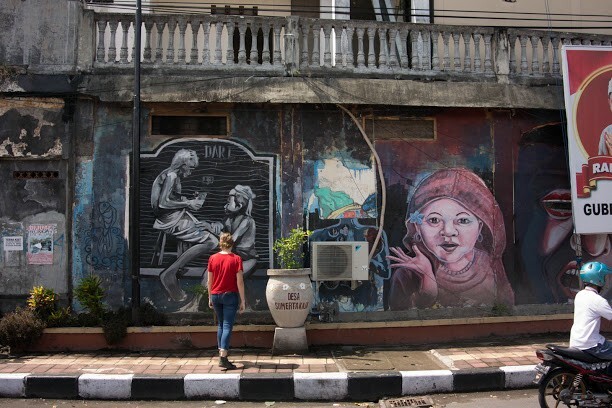 The first project was a Bali Street Art hunt, where we pulled over the minute we saw some murals while driving through Denpasar to take photos of the street art. Later, the students were to reflect on what the message was behind this in an attempt to better understand our home island and country. The second mission was much more macabre, and one which I was a little worried would be coolly received. A few months back I found a skeleton of a small animal in the forest, and researched how to process it so that I could use it as some realia in a Science class. I enjoyed the process, and figured that with more skeletons and skulls we could do some really neat comparative morphology studies. The mission was to go to the bird market (which is also said to harbour illegally traded animals) and find some corpses which we could then process. It would mean using Indonesian to ask for the animals, putting ourselves in a place which we collectively are at odds with, and handling the corpses when we returned to school. Surprisingly, all the students expressed interest in this and were willing to be part of this team as well. 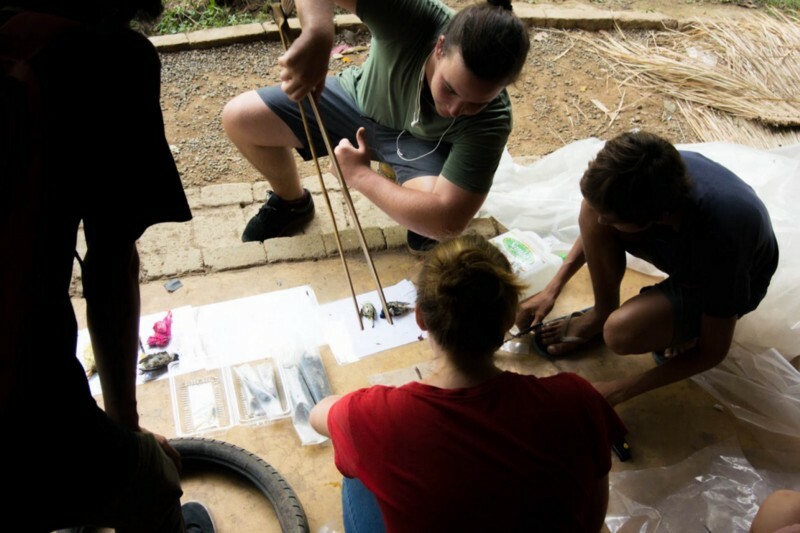 The final mini mission was to source a few different insect larvae that Mau had learned could digest plastic and Styrofoam, turning a non-biodegradable material into fertilizer. For this, we could also hit up the bird market, as well as do a bit of background as to which other places may sell meal worms, wax worms, and other wriggly guys to us. Upon acquiring the worms, we would then set up some trials to see how effective they really are in decomposing these materials. I could not be happier with the outcome of our week of mini missions. The students were exposed to so many ideas, all of which could turn into larger projects, or even into a life of work if you really were keen. It was very satisfying to see our students smiling and excited about learning, and the number of questions asked as we were going about lead me to believe that learning was happening. Not surprisingly, getting out and about also had some other effects on the students. Many were amazed at how you could access beautiful nature so close to school as we headed North. Going into Denpasar also had the same effect. As a place that is commonly connected in our school culture as a place of traffic and dirt, many student commented on how interesting it was to walk around in this city. We managed to demystify what was North and South of our school. The reactions to the bird market were also noticeable. While it was disturbing, it also lead to conversation about how we find it horrible when beautiful birds are caged and then have no issue eating a chicken which has lived its life in this exact circumstance. Maybe it was just coincidence, but our lunch following the bird market had a considerably higher ratio of vegetarian students than I expected. As for projects, I know some students got hooked on the idea of learning more about anatomy through our bone talk. One student was curious about how this may be used for art, and what kind of messages could be delivered through art pieces that use bones as media. Others were ecstatic hearing our newly acquired meal worms nibbling away at the Styrofoam, and seemed keen to continue exploring whether this affected their health long term. Our projects which will come about next week may deal with very different ideas than those we covered, but through doing these our students are now loaded with potential. Each of these activities allowed them to clearly see the power of creativity. At the very least, we have created a group of individuals who look at roadkill as opportunity rather than disgust. The writer is Noan Fesnoux, Green Studies Projects Coordinator, Green School Bali, Indonesia. Noan will be joining us at at a keynote panel discussion on “Applied learning in schools: Making lessons more in tune with real” at EduTECH Asia. Dont miss this chance to meet him in person and many other renowned educator from across Asia on 8-10 November.